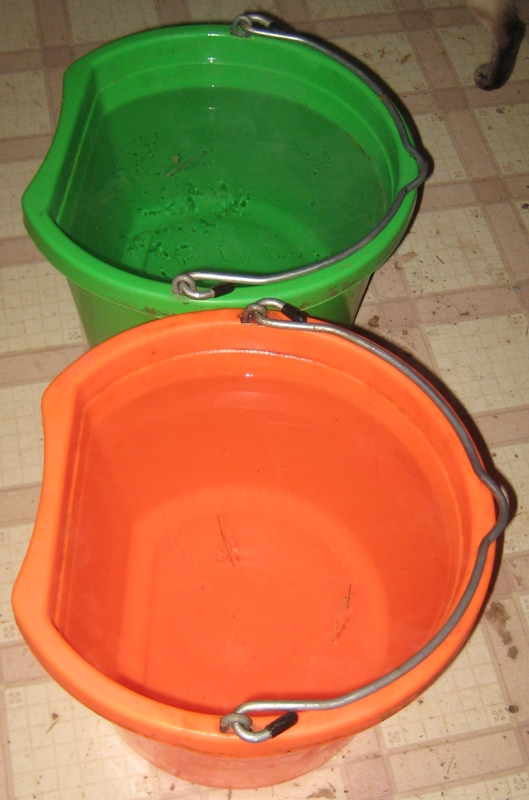 Buckets of warm water ready to be carried to the barn on a cold night. They love it, they drink more, and it happens just frequently enough that we, the barn we, are willing to tote the buckets. How do you spoil pamper your horse(s)? It’s my right as a Canadian to scoff. Here in the Great White North we haul hot water because we have to. Because otherwise the buckets freeze in 10 minutes. With a generous splash of the stuff straight out of the hot water tank, you might get an hour before the ice starts to form. When was the last time you had to swing all your buckets at a stone wall to smash 40 lbs of solid icecube outta them? Spring’s finally hinting at showing up here. Not a moment too soon. That brings back memories of when I lived in Kentucky and did exactly that – breaking up ice. I also discovered that I could tell the difference between -25 and -26! -25 was still do-able. At -26, my contact lenses froze – in my eyes. Ah life as a softie in the Deep South!!! !